When the extravaganza that is the first round of the NFL Draft unfolds this Thursday, general managers and coaches won’t be the only ones doing the gambling. Thanks to a number of leading New Jersey operators – FanDuel Sportsbook, DraftKings Sportsbook, PointsBet and BetStars – Garden State bettors will be able to do their own fair share of prognosticating around the annual player lottery. We’re almost a full year removed from the Supreme Court’s May 2018 landmark decision that opened up the possibility of non-Nevada sports betting markets via the eradication of the Professional and Amateur Sports Protection Act (PASPA). Thus, in what has been nearly 12 months of sports betting “firsts”, we’re about to commemorate the first year that football/wagering aficionados outside the Silver State can wager legally on a wide array of NFL Draft-based props. Any time a quarterback is even in the conversation as a potential top overall pick, interest in the draft tends to be stronger overall. We have such a scenario this year with former Oklahoma Sooner Kyler Murray. He earned the buzz with a junior season in which he amassed 5,362 total yards (4,361 passing, 1,001 rushing). While momentum for the two-way threat as the top selection seems to be on a definite upswing in the eyes of oddsmakers, that’s more of a recent development at FanDuel Sportsbook. The operator’s representatives confirm that Murray actually opened with +160 odds to be taken at the top of the draft. That checked in just below initial favorite Nick Bosa (+110). Murray was subsequently bet down as low as -1200 after we got wind of a Kliff Kingsbury infatuation in Arizona. Murray currently sits as the odds-on favorite at -500, with at least an element of doubt persisting with respect to his eventual destination (more on that below). FanDuel also confirms the top overall draft pick prop has generated the greatest amount of handle thus far. Meanwhile, it’s OSU’s Bosa that’s actually attracting the highest volume of bets from Garden State bettors as the potential N0. 1 overall selection. Both FanDuel and DraftKings representatives report Bosa as the recipient of the most wagers to be selected at the top of the draft, with the latter specifying 56.0 percent of bets have come in on the former Buckeye. However, it’s still Murray who’s prompting the most handle at DraftKings in that regard — 56.0 percent of money wagered on the first pick is coming in on the quarterback. The Cardinals as prohibitive favorites for Murray increasingly appears to make sense, although there’s certainly still a chance a team knocks their socks off with a lucrative enough offer. It bears noting that a somewhat unlikely source – former NFL receiver Antonio Bryant – recently tweeted that he’s heard from people “inside the Cardinals’ organization” that Ohio State’s Bosa now tops the team’s draft board. But, there’s more billowing smoke than a five-alarm fire this time of year, so that has to be taken with a grain of salt. Granted, the fact last year’s 10th overall pick Josh Rosen remains on the roster is another proverbial fly in the ointment. However, a draft-day trade of Rosen may well be forthcoming. Murray seems to be the likeliest top pick even if the Cardinals aren’t the team to nab him. That’s the sportsbooks’ prevailing view, as Murray is currently a pretty clear favorite over the next-closest candidate in Bosa. If the Cards do indeed choose to stick with Rosen – a player the new coaching regime has no inherent loyalty to – they’re probably more likely to take the king’s ransom that will undoubtedly be offered to them for the top selection. That would almost assuredly mean sacrificing a chance at Bosa in the process, since their potential trade partners would come from the No. 6 spot in the round down (with the Raiders at No. 4 as a possible exception). The quarterback-needy Giants are getting plenty of local interest as the team to nab the “other” big-name quarterback in this year’s draft. New Jersey bettors are plunking down plenty of cash at FD on Haskins heading to the Big Apple come Thursday. The athletic OSU alum makes for an attractive consolation prize should the G-Men decide the price to move up five spots to grab Murray is too rich. Notably, the Giants’ NFC East-rival Redskins actually are the current FD Sportsbook favorites (+280) to grab Haskins. While Washington traded for Case Keenum this offseason, the cost was only a 2020 sixth-rounder. Haskins and the team have publicly displayed mutual admiration as well, adding to the intrigue. But, to secure Haskins, the ‘Skins will presumably need to pay a fairly hefty price to move up from No. 15 and vault ahead of the Giants at No. 6, in the event New York’s reported interest in Jones is nothing but a smokescreen. Bosa is the clear leader across all three books, while Alabama defensive end Quinnen Williams is a locked-in second choice. The current owners of the No. 2 pick, the 49ers, clearly can use the defensive line/pass rushing help that either player could provide in spades after tying for the seventh-fewest sacks (37) last season. And, both the Jets and Raiders, owners of the No. 3 and No. 4 picks, respectively, would undoubtedly stand to benefit from Williams’ vast talent in the interior of their defenses as well. DraftKings oddsmakers clearly see the G-Men going quarterback with their first of two first-round picks. It’s easy to see why. Eli Manning isn’t long for the Big Apple and has no clear-cut successor on the roster. Haskins is widely considered to be a better prospect than Jones. However, Jones amassed a rock-solid college resume as a three-year starter at Duke (8,201 passing yards and 1,323 rushing yards/ 52:29 TD:INT) and turned in an impressive pro day. Recent reports that an unnamed team has Jones as the No. 1 QB on its draft board fuels speculation it could be toss-up between the two signal-callers when it comes to New York’s pick. Then, White compiled 28.5 tackles for loss and 8.5 sacks in three seasons at LSU. He would certainly help shore up a Giants defense that ranked in the bottom half of the NFL in rush yards per game allowed (118.6) and tied for second-fewest sacks (30). However, New York appears likely to address their sizable need under center with the first of their two first-round selections. Oliver seems to be gaining momentum after reports of the Jets’ intense interest. With 53 tackles for loss and 13.5 sacks in three college seasons at Houston, that news isn’t surprising. That’s especially true when considering New York allowed the seventh-most rush yards per game (126.3) in the NFL last season, along with 16 rushing touchdowns. However, Kentucky standout Allen is breathing down his neck and is the public’s choice thus far. He brings plenty of impressive credentials in his own right (42 tackles for loss, 31.5 sacks). The Eagles have been trying to address the backfield for some time now. Their approach of mix-and-matching specialty backs hasn’t yielded too much success, so the oddsmakers seem to feel they’re most likely to nab the ultra-efficient (5.9 career yards per carry at Alabama) and multi-talented (2,062 total yards from scrimmage) Jacobs. More NFL Draft betting options? College basketball clearly reigns supreme in March sports betting circles. But the NFL always looms large. That seems to be true irrespective of where we stand on the calendar. From a general fandom perspective, it’s the unfailing pace of the offseason that does the trick. The “Underwear Olympics” — aka the Combine — in late February/early March. Free agency later that month. The draft (and the hype that precedes it) in April. Mini-camps in May. And full-fledged training camp, along with HBO’s Hard Knocks, beginning in late July. Now that legalized sports betting is slowly but surely spreading its wings, the drip-drip fashion in which the national Week 1 games are released in the latter stages of March could start taking on added significance. That immediately leads to the first betting lines of the regular season, which equates to another temporary offseason “fix” for the proverbial NFL junkie. DraftKings Sportsbook and FanDuel Sportsbook were both glad to oblige on Monday. 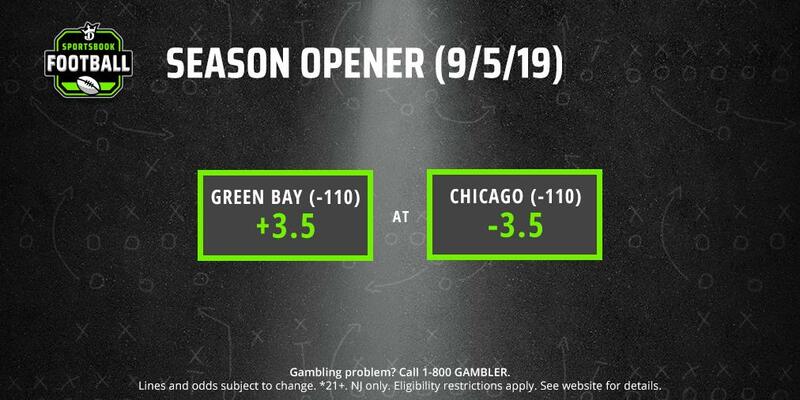 Each released point spreads for the Green Bay Packers–Chicago Bears showdown that we now know will officially kick off the 2019 regular season on Thursday, Sept. 5. FanDuel is also listing moneyline odds for the game. Unsurprisingly, both sites have the Bears installed as favorites. The fact the game unfolds at Soldier Field would essentially grant Chicago a three-point cushion from the jump. Interestingly — considering the disparity in the 2018 records of both squads — the oddsmakers aren’t going too far beyond that number. The Bears opened as four-point favorites on FanDuel. DraftKings goes further, shaving a half-point off that number. Moneyline odds on FanDuel sit at -194 for a Chicago win and +166 for a Packers upset. The Bears bowed out in the wild-card round of the playoffs last year with a heartbreaking 16-15 loss to the Philadelphia Eagles. Since-released placekicker Cody Parkey missed a 43-yard field-goal attempt with 10 seconds remaining to abruptly end Chicago’s season. The Bears secured the NFC Central crown with a 12-4 regular-season mark while allowing the fewest points (283) in the league. Meanwhile, the Packers saw franchise cornerstone Aaron Rodgers get through the season on essentially one knee. No matter, Rodgers still threw 25 touchdown passes and only two interceptions. He also racked up 4,442 passing yards, the second-highest total of his career. Yet, a defense that allowed 400 points helped lead to a 6-9-1 record, including a 1-7 road tally. Neither team made any splashes in free agency, either. In fact, the Packers lost long-time but oft-injured Randall Cobb to the Dallas Cowboys. But, Green Bay did prove a tough out for the Bears in their two meetings last season. Chicago prevailed 24-17 in a Week 15 meeting at Soldier Field, although the game was tied at 14 heading into the final period. However, the Pack had gotten the best of the Bears in a memorable Sunday night season opener at Lambeau. Rodgers bounced back after suffering the knee injury that ultimately would plague him all season to throw three second-half touchdowns for a wild 24-23 win. Notably, the Bears have dropped five of their last six regular-season meetings with the Packers, and nine of their last 12 overall. That track record — as well as the impact of a presumably healthy Rodgers and new head coach Matt LaFleur‘s playcalling — may certainly be influencing the relatively narrow line. In addition to the Packers-Bears divisional showdown, the NFL has announced the defending champion Patriots will headline the 2019 debut of Sunday Night Football against a to-be-determined opponent. The remainder of the NFL regular-season schedule is typically unveiled in mid-to-late April in the days leading up to the draft. Faster than one of James Harden‘s eye-popping 291 three-pointers (and counting) finds the net, PointsBet made some noise in the New Jersey betting landscape this week. Harden racked up 42 points over 39 minutes in an on-the-road win versus Boston. That pushed his season averages to 36.7 points, 7.6 assists, 6.6 rebounds and 2.2 steals over 59 games. The scoring and steal averages both represent career highs. Among the many highlights of his jaw-dropping campaign is a just-snapped 32-game streak of 30-point efforts. That ranks as the second-longest such stretch in league history. In other words, the payout seems a reasonably safe proposition at the moment. But, it’s not as if Harden is without competition. The Thunder’s Paul George likely represents the biggest threat to PointsBet potentially taking a bath on the decision. Like Harden, PG13 is also enjoying a career season. Despite sharing the floor with a former MVP in Russell Westbrook, George leads OKC with a career-best 28.6 points and is notably outpacing Harden in rebounds (8.1) and steals (2.3). The Bucks’ Giannis Antetokounmpo, the aptly nicknamed “Greek Freak,” is likely the only other relatively serious challenger for the MVP crown. He’s behind both with an average of 27.6 points per game. However, his average of 12.6 rebounds is easily the highest of the trio. PointsBet’s move is newsworthy, but not unprecedented, in the New Jersey market it recently entered. On Dec. 1, FanDuel Sportsbook became the first legal operator in the United States to engage in an early payout. It was one it ultimately wouldn’t have had to make, had it stayed put. On that date, FanDuel Sportsbook cashed out all customers who’d placed futures bets before Nov. 30 on the Alabama Crimson Tide winning a third national championship in four years. At the time, the Tide seemingly had a leg up on the handful of potential candidates for the mantle of college football’s top team after another perfect 12-0, regular-season mark. The listed odds (at the time of FanDuel’s decision) of -280 reflected as much. Of course, the best-laid plans of mice and men (and sportsbooks) and all that good stuff. The Clemson Tigers ultimately handed Nick Saban‘s crew a 44-16 shellacking in the national championship game on Jan. 7. Ultimately, FanDuel paid out $40,000 on the early bets and an additional $42,000 on winning wagers involving the Tigers. And it’s worth noting the former figure doesn’t include parlay bets including an Alabama win that didn’t close out until after the date of the game. The Harden payout is the second significant ripple in the NJ sports betting pond that Australia-based PointsBet has made recently. In the latter portion of February, the operator announced a marketing-focused partnership with Topgolf in the state that will mostly be centered around major sporting events. The most imminent example of such is a March Madness-themed Hole in One competition that will unfold at the Topgolf’s Edison and Mount Laurel locations. It will feature a $25,000 grand prize to be awarded March 23. Like FanDuel, PointsBet surely feels reasonably confident that the money it just shelled out was leaving its coffers later this year anyhow. And if the “never say never” scenario plays out and say that George takes home the MVP in an upset? PointsBet is undoubtedly banking on the goodwill and promotional benefits of its move making it worthwhile over the long term in an increasingly competitive New Jersey market. Kyler Murray‘s NFL draft position won’t be the only thing on the line when the dynamic Heisman Trophy winner runs the 40-yard dash at the 2019 NFL Combine. Thanks the expansion of legalized sports betting, this year, multiple New Jersey sportsbooks and bettors will also have money at stake on the performances of Murray and his fellow Combine participants in multiple drills. For years, the NFL Combine has served as the proverbial oasis in the desert of the offseason for football enthusiasts. While many of that year’s draft-eligible college prospects display their athletic wares in a multitude of drills, fans are left to dream of what could be if their favorite team nabs one of the best from the college ranks at a position of need. On its own merits, the annual talent evaluation extravaganza does actually have some redeeming qualities. For example, there’s plenty of elite athleticism demonstrated in tests like the 40-yard dash and quarterback/receiver passing drills. And for 16 years, the bench press test always carried a bit of extra flavor thanks to inimitable strength coach and spotter John Lott, who encouraged, cajoled and generally worked players into a lather in an attempt to squeeze every last rep out of them. But this year, there’s the added element of intrigue that may trump all of that — cold, hard cash. Like the just-completed Oscars and the forthcoming NFL draft, the NFL’s annual “underwear Olympics” is yet another new, rather unlikely, wagerable event this year. BetStars NJ, DraftKings Sportsbook and PointsBet have a robust selection of Combine-based wagers centered on the major drills that will be completed during the five-day period between February 28 and March 4. Interestingly, each of the three sportsbooks is taking a slightly different tack with the type of wagers offered. For its part, PointsBet is seemingly taking a cue from both of its fellow Garden State sportsbooks in terms of the variety of Combine bet types on its board. PointsBet is offering both over/under wagers on top numbers for each individual drill and wagers on whether the all-time best performances in each of them will be eclipsed. Although the NFL railed against legalized sports betting for what seemed like forever, top executives in each of its franchises have enthusiastically engaged in a form of high-stakes, league-sanctioned gambling every spring for decades. More commonly known as the NFL Draft, the late-April ritual sees multiple higher-ups in each organization put the fortunes of both their teams and their reputations as talent evaluators on the line each year with the players they deem worthy of selecting from college football’s ranks. Given that it’s long been a televised extravaganza during a time of year where the average football fan is jonesing for some NFL-related excitement, it’s no surprise the draft has also progressively turned into a betting event for the public. In prior years, Nevada sportsbooks were the place to go for any legalized wagering on the yearly player lottery. Naturally, the options have expanded significantly ahead of the 2019 edition of the draft. Some New Jersey operators — DraftKings Sportsbook, BetStars, 888 Sport and PointsBet — have jumped on board to varying degree. BetStars is currently the leader in the clubhouse when it comes to sheer volume of offerings. PointsBet, which just announced a marketing partnership with Topgolf in the state, is a close second for the moment. Meanwhile, both 888 Sport and DK Sportsbook are playing things close to the vest at this point. Their currently available props center on arguably the most recognizable name in this year’s draft overall — Oklahoma Sooners quarterback Kyler Murray. Murray’s recent announcement that he’d forgo a professional baseball career with the Oakland Athletics to pursue football was a boon to the general interest level for this year’s draft. The 2018 Heisman Trophy winner brings some much-needed star power into the first round after racking up a whopping 5,362 total scrimmage yards (4,361 passing, 1,001 rushing) and 54 total touchdowns (42 passing, 12 rushing) in his just-completed junior season. While the props selections and odds naturally differ from sportsbook to sportsbook, there seems to be consensus in one particular area: the quarterback- and excitement-starved Miami Dolphins, which are believed ready to move on from Ryan Tannehill, are the likeliest landing spot for Murray. Prior to Murray’s announcement, the top of the draft was poised to be headlined by defense. While OSU’s Nick Bosa, Kentucky’s Josh Allen and Alabama’s Quinnen Williams are undeniably blue-chip prospects and make plenty of noise terrorizing quarterbacks, nothing gets buzz going like the signal-callers themselves. On that note, Bosa’s teammate Dwayne Haskins, who’s shot up draft boards after a 50-touchdown sophomore campaign, is also a first-round luminary. Accordingly, he’s also drawing some draft-prop love as part of the aforementioned voluminous selection of wagers at BetStars. Notably, DK and 888 Sport both currently check in with matching betting options and odds on both Murray’s possible draft position and the top five teams most likely to draft the dynamic quarterback. With the draft still over two months away, there naturally could be plenty of other props added by both operators, as well as others in the state. FanDuel still in wait-and-see mode? FanDuel Sportsbook is one major New Jersey sportsbook that’s yet to offer any NFL draft odds. The operator does have NFL futures bets in the form of the next year’s Super Bowl winner, as well as conference champions for the 2019 season. A request for further clarification on whether the company will eventually offer NFL draft odds is pending a final response as of this writing. However, based on how wagering options have unfolded in New Jersey thus far during the state’s brief history with legalized sports betting, it would appear likely we’ll eventually see FD follow suit to some degree.